Action cams have become more and more interesting in recent years - not only for extreme athletes who want to share their adventures with friends, other athletes and the world. Creating trend videos from sports with the action cam while riding motorcycles or skiing has now arrived for the masses. When one thinks of videos full of action, one camera immediately comes to mind: GoPro Hero. But this is far from the only action cam on the market. Other manufacturers offer adventure film makers cameras for capturing journeys, jumps and flights and sharing on YouTube, Facebook and other platforms. This 65g weight action cam is the ideal companion for the road: Light, with little wind resistance and even easy to use while wearing gloves. The camera can also recordin the water using the live view remote control, thanks to the water-proof housing (up to 5m), or be controlled viaa smart phone, thanks to the WIFI function. Panorama shots without fish-eye effect are possible due to the wide-angle lens from ZEISS and stereo recordings which accompany your videos can be made easily. And if you get lost in your adventures, the action cam will continue to help you with a map and GPS function. 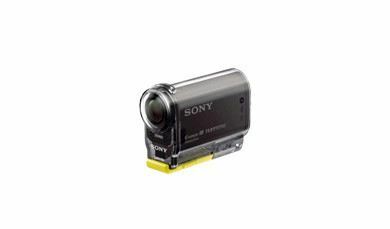 The Sony HDR-AS30V Action Cam is available from 249€. Laser Navig8r sport cams: Small, waterproof and with a touch screen. This particularly sports-oriented camera is impressive with clear resolution, details and a waterproof case up to 100m. The camera can be perfectly adjusted using the laser pointer and can be wirelessly set and operated. For example, the Sports CameraFull HD 1080P 60FPS offers all this. In addition, the action cams Sports CameraFull HD 1080P and Sports Camera HD 720P still offer a touch screen via which they are operated, further simplifying filming. Prices vary depending on the model. This camera particularly stands out from others for one thing: It neither has a button to turn it on, nor to turn it off. The recording switch takes over this function so that everything is easier to use, when this is too difficult to reach due to clothing or the attachment of the camera. The sensor lens unit can be rotated 270 degrees and the resolution can be reduced so that more images can be taken per second. The ContourROAM 2 Action Cam is available from 159€. With its quad-proof housing, this action cam is waterproof up to 5m, shockproof to a height of up to 2m, dustproof and resistant to frost. This compact camera can be easily attached anywhere and offers an extended image area for action videos through the wide angle lens. The videos just made can be sent or streamed directly to friends with the WIFI function. In addition, the JVC GC-XA1 creates the videos in MP4 format, so no troublesome conversion stands in the way of the adventurer's view. The ADIXXION JVC GC-XA1 Action Cam is available from 138€. The housing is waterproof up to 30m, and the handiness of the camera allows you to bring it anywhere. The videos can be transferred without problem via a USB cable and the camera can be loaded for new adventures. The 120 degree lens opens up a wide image experience. This camera has no WIFI function, in contrast to the others. The KaiserBaas X80 Action Cam is available from 128€. This is only one of the many action cams that are on the market. With this choice, everyone can find what they are looking for, with all the features that may be desired. As different as the cameras may be sometimes, there is one thing they have in common: the videos need to be improved. Some recordings are blurry, distorted by the fish-eye effect or the colours are not as intense as in reality. Different action cams - a solution: ProDRENALIN from proDAD! The software that reworks, improves, and makes every adventure video worth watching. Stabilisation, equalisation, colour correction and that from 34.90€. The must-have for every action cam.